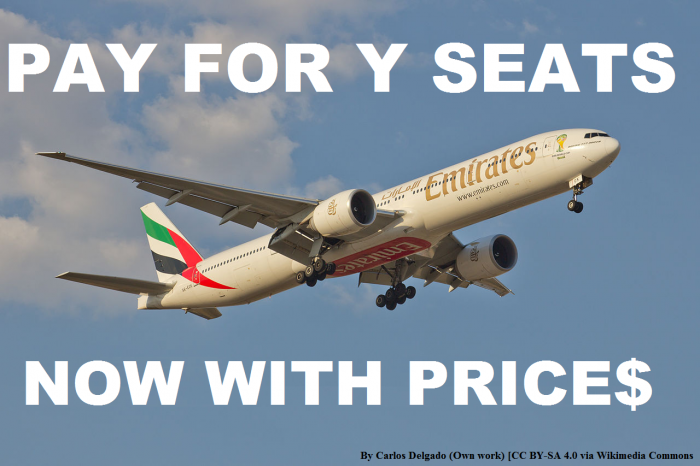 Emirates quietly and without fanfare introduced seating charges for those flying on discounted economy tickets effective on October 3, 2016. .
You can access Emirates eating charges charts here. Note that you must pay seat selection charges for each leg of your journey separately (if you wish to choose the seat in advance). Seat selection is free when done during the online check in. Considering that many Emirates customers fly with children this almost forces them to pay to select in advance to ensure that the family is not spread out throughout the cabin. It is sad that Emirates is taking this turn. The airline used to be a full service one. When we will see other charges introduced or reduced other services?